Have you ever found yourself bamboozled by all of the different kinds of information on our plasmid pages? Well, to help make the most of these pages, we've written this post to guide you through them and make the best use of all the information provided by your colleagues. The ‘breadcrumb’ trail at the top of any plasmid page gives the hierarchy of web pages the plasmid page is nested in. You can see in the example above that the bread crumbs trail starts in the browse page, continues through the depositing lab page, then onto the publication page, and finally on down to the individual plasmid page. 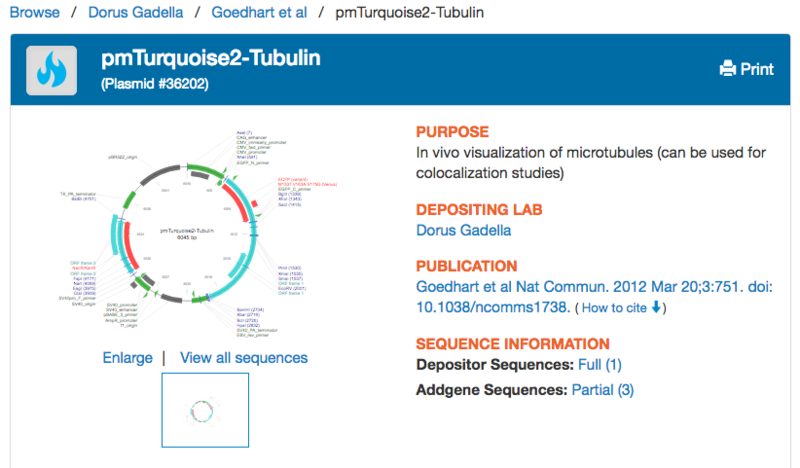 The depositing lab page contains all the plasmids from the same lab while the publication page contains all the plasmids deposited from the same publication. The Addgene plasmid number: This is the unique number given to every plasmid in our catalog - if you know the catalog number of the plasmid you are searching for, this is the quickest and easiest way to find it! But what are all those flames about? 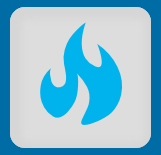 Flame logo: The flame that appears beside some of Addgene’s plasmids is an indication of popularity. A yellow flame indicates that a plasmid has been ordered more than 20 times; red, more than 50; and blue, more than 100 times! When you search for plasmids on our website, one of the available filters popularity (e.g. only showing those plasmids which have been ordered more than 100 times). I guess it's cool to be popular, but how do I know if a plasmid is actually useful to me? Plasmid purpose: This is a brief description of what the plasmid was designed and used for in the depositing lab, although you may have an entirely different use in mind! This section of our plasmid pages is relatively new, so some of our older plasmids may not have an entry in this field. If you’ve deposited a plasmid without a purpose and would like to fill in this section, let us know! Is there a way for me to quickly check out the plasmid's structural features and see if I can easily clone my gene into it? Your best bet is the Plasmid Map: We auto-generate a plasmid map based off of the plasmid sequence and feature information given by our depositors. Many depositors also upload their own detailed plasmid maps as part of the deposit process and these can be found in this location as well. 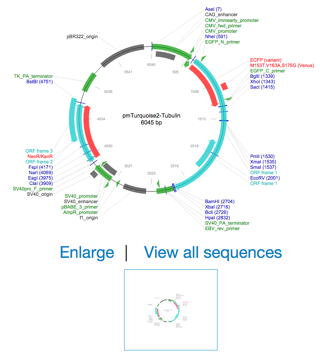 These maps make it easy for scientists to see if the plasmid would be useful for their own research, and helps requestors use the plasmid in their own labs. We highly encourage depositors to provide plasmid maps whenever possible. GenBank files can also be uploaded onto our plasmid pages, but these are found in the "Resource Information" section of the plasmid page (discussed below). Great! Now, if I want to use this plasmid in a publication, how do I know who to acknowledge? Depositing lab: The name of the Principal Investigator (PI) in whose lab the construct was made. The depositor name links to a page listing all of all this PI’s plasmids that are available through Addgene. How to cite this plasmid: The Recipient Scientist Acknowledgement (RSA) asks requesting scientists to cite the depositing lab whenever their plasmids are used in a publication. 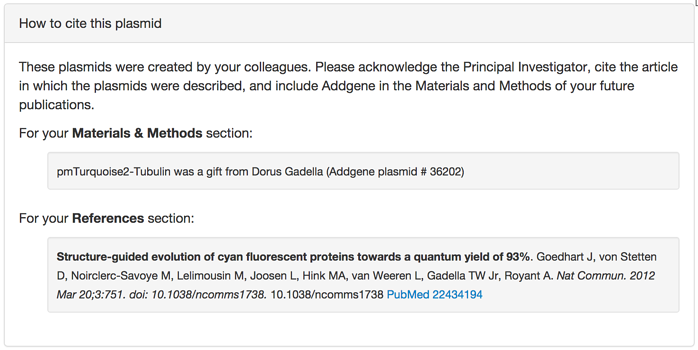 Addgene makes this easy by providing a template citation for you to use in your Materials and Methods and References sections when citing the use of your colleague’s plasmid. Use the Addgene catalog number to easily find template citations for Addgene plasmids you have used in your research! Sequence information: Depositors may provide full or partial sequence information for their plasmids, and if so, these will be made available as ‘Depositor Sequences’. Additional partial sequence information is also available from Addgene’s sequencing reactions (‘Addgene Sequences’). These sequences are provided in FASTA format (example) and can be analyzed using Addgene’s Analyze Sequence tool. Excellent, how can I check if the plasmid will be within my lab's budget? Ordering: Check the Price of course! The price of some items vary, for example, plasmid kits are avaliable for less than than it would cost to buy each plasmid in the kit individually. If I order the plasmid, how will it be sent to me? Description: This describes how the plasmid or other product (kit, pooled library, etc) will be sent to you. Most of Addgene’s single plasmids are sent as bacterial stabs at room temperature. I've looked at the map and I know the plasmids purpose, where can I find more detailed information about the plasmid contents? Backbone: The starting vector that the depositing lab modified to create their new plasmid. The Addgene Vector Database has more information about common vector backbones. The backbone modifications listed can refer to changes made to the original backbone by the depositing lab, or by a previous group. If the plasmid was made by a modifying a vector previously deposited with addgene, you can list the original vector’s plasmid number here. Gene/insert: This describes what has been inserted into the backbone, and provides information about this gene or DNA element of interest. If the depositor has indicated that there is a particular mutation found within the gene/insert, this information can be found here. There may be more than one gene inserted into a backbone, and each is given its own gene/insert section on the plasmid page. Tags are listed according to whether they’ll end up on the N or C terminus of the transcribed and translated insert. If it is an empty vector with a tag, it’s terminus will be listed as the most likely terminus the tag will end up on after successful cloning. 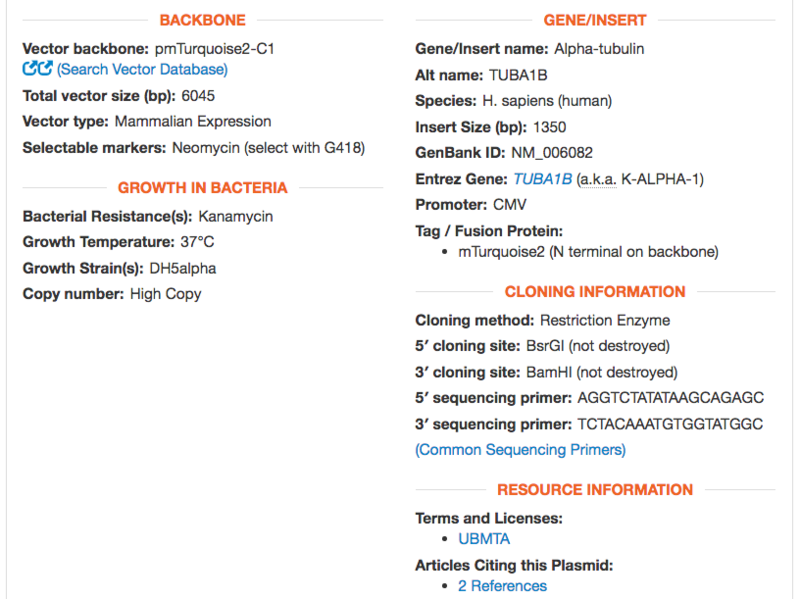 Cloning information: This section provides useful information about how the vector was assembled, and enables requesting labs to utilise and modify the plasmid in their own lab. If depositors have provided primer sequences for use, these are listed. We also provide a link to our list of common primers used for sequencing. Growth in Bacteria: This section describes how to grow the bacterial strain in which the plasmid is shipped. Copy number (if known), antibiotic resistance, and optimal growth temperature are listed, as well as the name of the strain. Most Addgene plasmids are maintained in the E. coli lab strain DH5a, but others may require strains such as ccdB survival (for Gateway plasmids). We also like to store plasmids that need extra stability, such as some of our viral vectors, in NEB Stable cells. Resource information: This section contains information about the lineage of the plasmid (e.g. if it was derived from a plasmid made in a different lab - or one obtained from Addgene!). It also contains links to any agreements under which the plasmid is distributed. All Addgene plasmids are distributed under the terms of the UBMTA to protect our depositors’ IP, but there may also be extra terms associated, such as when a plasmid contains certain fluorescent proteins. Finally, for many plasmids you can find additional resources provided by the depositor including genbank files and protocols here. Articles Citing this Plasmid: This is a relatively new feature of our plasmid pages, and provides a list of publications which have used the plasmid (see our blog post) for more information about this feature!). This means you can see which labs have already used a particular plasmid, and which experimental systems it was validated in.